When you run out of space on the ground, what do you do? Stop dreaming up new ideas and go home, or come up with a creative way to make your project work? Dan Barasch and James Ramsey didn’t allow the lack of green space in Manhattan to stop them in their tracks, and soon proposed a Kickstarter campaign to build a park underground. The Kickstarter campaign for the underground park has already surpassed its $100,000 goal, which will be used to build a “mini LowLine” to show locals and potential sponsors that the project is quite doable. After that, a full-blown demonstration of their skylight technology and structural and ventilation research will be developed. Creative thinkers and innovative entrepreneurs are looking to be NYC’s biggest asset in making a it a much greener city. The HighLine, a park built on a rail line above the streets of Manhattan’s west side is previous example of this, and the organization in charge of it received donations large enough to complete the entire project in one fell swoop. If Barasch and Ramsey demonstrate LowLine to be an equally beneficial project, they may not be far from receiving donations of equally large sums. 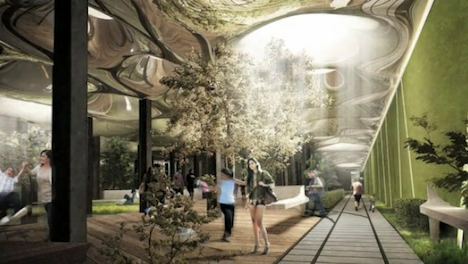 The LowLine creators are hoping to set up the park in the former Williamsburg trolley terminal on the Lower East Side, which has been abandoned since 1948. You’re probably visualizing this as a dark, desolate park with no greenery and dirty sewer pipes for playground material, but they’re planning to be using fiber optic cables to direct sunlight underground. Street level solar collectors will collect sunlight all day, reflecting that light underground and allowing for a lush green space full of plants, grass, and trees. Additional lighting and ventilation systems will be provided for air quality and enough light on the cloudier days. The 60,000 square foot, 1.5 acre park will be creatively built around much of the original architecture including railroad tracks, strong steel columns, 20-foot ceilings, and old cobblestone. This sounds like just the place I’d like to hang out. Can you imagine how much character this park will have? If this sounds like your kind of park, you can still donate to their Kickstarter campaign and help get this project off (or under) the ground. Could you see yourself using a park like this?